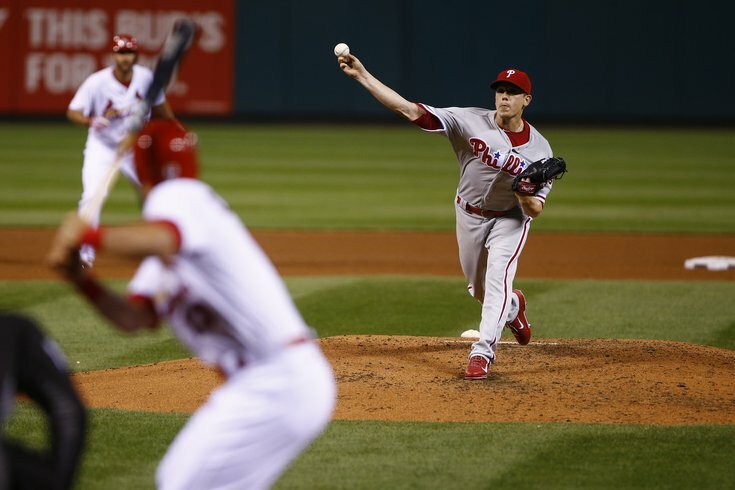 Philadelphia Phillies starting pitcher Jeremy Hellickson didn't have his best stuff against the Cardinals. The Philadelphia Phillies entered play on Monday a surprising 15-10 and in the middle of a six-game winning streak that included back-to-back sweeps of the Nationals and Indians. In each of those six games, however, the Phillies failed to score more than four runs — something they’ve only done six times this season, three of which came against the NL’s worst pitching staff in Milwaukee. Eventually, that lack of scoring had to catch up of with Pete Mackanin's club. Phillies may be hottest team in baseball, but are they really this good? So you want to hit at Citizens Bank Park? And on Monday night in St. Louis — combined with a surprisingly rough night from a pitching staff that has been rolling lately — it did just that. The Phillies win streak was ended as they lost their series opener, 10-3, to the Cardinals, who hit five home runs and scored 10 unanswered runs. Facing Adam Wainwright, the Phillies struck first in the top of the third when Freddy Galvis hit a bases loaded single to plate Jeremy Hellickson and Peter Bourjos to give the away team a 2-0 lead. Maikel Franco followed that up with a sacrifice fly two pitches later to score Odubel Herrera and make it a three-run game. Unfortunately, that would be it for the Phillies. In the bottom of the fourth, Wainwright took it upon himself to make sure he wasn’t hit with a loss. With two men on and two outs, the Cards starter crushed a Hellickson fastball into the upper deck in left field, where it landed 408 feet later. It was Wainwright’s second extra base hit of the game; he hit a double in his first plate appearance. The long ball would be the theme of the night for the Phillies pitchers. In the bottom of the sixth, Matt Adams and Aledmys Diaz went back-to-back to give the Cards a 5-3 lead. Two batters later, after allowing a single to Randal Grichuk, Hellickson (2-2) was headed to the showers. Stephen Piscotty added another run in the sixth off reliever Brett Oberholtzer, which also counted against the Phillies starter, to make it a 6-3 game. Hellickson not only picked up the loss, but saw his ERA rise to 4.88 in no time at all. His final line looked something like this: 5.1 IP, 7 H (3 HR), 6 ER, 5 K, 4 BB, 98 pitches (57 strikes). Oberholtzer didn't fare much better. At that point, the game was pretty much over; the Phillies had only scored six or more runs twice this season. But that didn’t stop the Cardinals from adding some more insurance in the 7th inning. 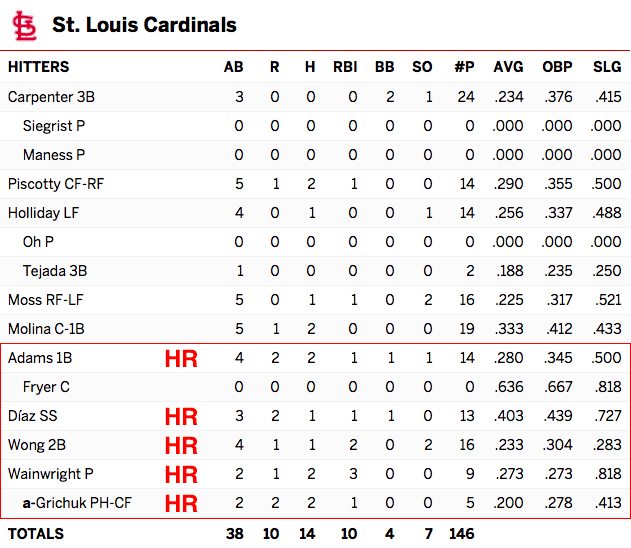 For the second time in the game, the Cardinals got back-to-back home runs — this time off Oberholtzer — from Grichuk and Kolten Wong to make it a 9-3 game. Brandon Moss would add the tenth and final run of the game in the bottom of the 8th. When all was said and done, Oberholtzer allowed four runs on seven hits in 2.2 innings. That's the first time in franchise history the Cardinals got HRs from the sixth, seventh, eighth, and ninth spots in their order. And it gets worse -- that home run by Wong was his first extra base hit of the season. The Phillies finished with eight hits — five of which came off Wainwright during his six innings of work — but again failed to score more than three runs. None of those hits, however, came off the bat off Maikel Franco, who has been struggling recently. He has just four hits in his last 28 at bats and has now gone eight straight games without a home run. Freddy Galvis, meanwhile, recorded at least one RBI for the third straight game (six total) and has now reached base safely in eight of the last 10 games, with hits in seven of them (including three straight). Odubel Herrera also got back on track Monday night. He finished the game 2-for-4 with a run scored after failing to reach base Sunday for the first time in 11 games. But it was Carlos Ruiz who had the best offensive night for the Phillies. He upped his average to .341 on the season after going 3-for-4 against the Cardinals. Then again, Chooch didn't have much to compete with in terms of offensive firepower.